Minister Avigdor Liberman sounds off on security threats, state and religion, and Elor Azariya during visit to city of Ariel in Samaria. Defense Minister Avigdor Liberman visited the city of Ariel in Samaria today (Monday), and spoke to media about various topics of interest. First came the ongoing trial of Elor Azariya, the soldier who shot and killed a wounded terrorist in Hevron. The trial has sparked widespread debate in the country, and much media coverage. "I expect that the military tribunal will be able to ignore all the preipheral noise and rule purely on the basis of the facts of the case, in accordance with events as they actually happened, without reference to political pressures from the left or the right. "In any event, we will stand by the soldier. Even if he did something wrong. We have an obligation to give a soldier all the support we can even when he makes a mistake." Liberman was asked what he thinks constitutes the greatest threat to Israel. "The greatest threat to Israel is Iran. This is Israel's greatest challenge and its greatest threat." 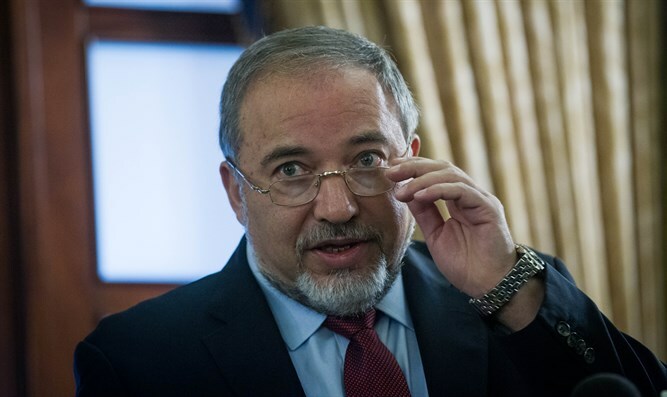 Liberman also addressed the matter of possible future agreements with the Palestinians, calling for swaps of land and populations as part of any future peace settlement. "This can be done in compliance with international law." The Minister opined that any peace treaty must be part of a general settlement with the entire Arab world. "No separate agreement constitutes a solution," he said. "We strongly oppose any religious coercion, while maintaining a great respect for the traditions of Judaism and the Jewish people. We believe in the principle of live-and-let-live. Each person should live according to their own conscience. My wife is a religious woman and I don't keep the Mitzvot. We looked for a mixed town in Judea and Samaria in which to live. On Friday nights I sit at the table and we light Shabbat candles, but then the next day I go out to play tennis or watch a soccer match. "We must separate religion and nation," Liberman stated, "we support a separation between religion and politics. Why do we need religious councils?" the Minister asked, "just like in every city hall there is an engineering department, a culture department, and more, so too there should be a religious services department within the municipality, not a religious council."